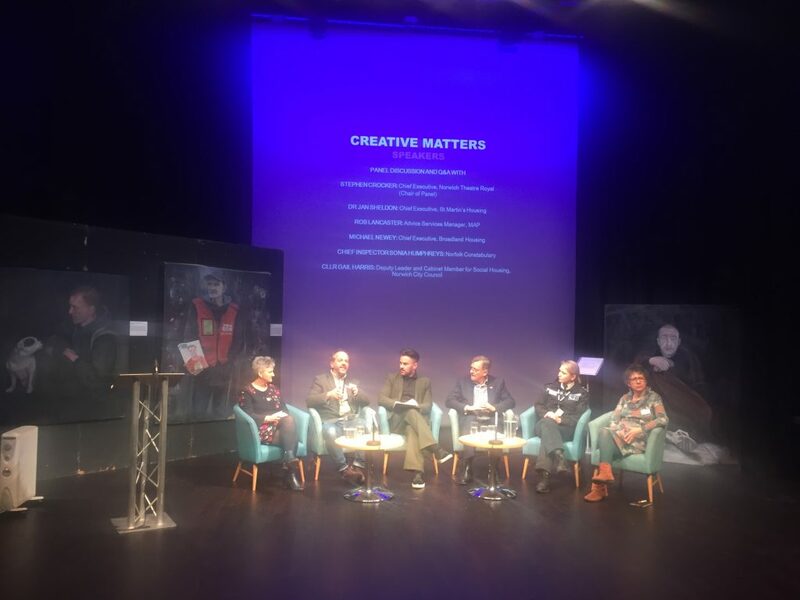 St Martins CEO Dr Jan Sheldon took part in a Q&A session, chaired by Stephen Crocker, the theatre’s chief executive, as part of the Creative Matters programme featuring discussion, debate, workshops, film and performance around homelessness this month (February). Speaking to panellists representing Norwich City Council, charity MAP, Broadland Housing and Norfolk Constabulary, Dr Sheldon spoke about homelessness being an indicator that something had gone seriously wrong for an individual and that partnerships were key to providing solutions. Dr Sheldon explained how St Martins started off in the 1970s focusing on providing accommodation for people but has developed its services to deal with a problem more complex than simply providing a home. Cllr Gail Harris, deputy leader and cabinet member for social housing for Norwich City Council, told an audience of representatives from various organisations, volunteers and members of the public, that organisations cannot ‘work in isolation’ as they do not have the capacity or the money. The event, which took place at the theatre’s Stage Two venue, showcased two Creative Matters projects. Researchers and directors Darren France and Laila Choat [pictured below] have produced a verbatim play commissioned by the theatre, and based on the words and stories of people experiencing homelessness, called Street Life. Devin Smith, who is a visual artist for the Art as Intervention exhibition also spoke about her work to connect people with those who are homeless. Mr Crocker said the programme aims to show situations of frustration to stories of hope, resilience and determination which this month will ‘shine a light on’. The play explores themes around relationship breakdown, mental health, domestic abuse and alcohol. Mr France, who has a background in theatre and youth and community work, working in mental health for 22 years, said people shared stories with them and talked about challenge and tragedy and the complete loss of hope at various points in their journeys but often regaining hope. Artist Ms Smith spoke about building a rapport with individuals and spending time learning and documenting their lives. Using portraiture, she looks to portray the human being people can empathise with. Many of the paintings were displayed on the streets of Norwich alongside the individuals who appear in them. One of her portraits features homeless man, Sergiusz Meges, who she had photographed sleeping near one of her paintings. In a sad twist, sometime after he died inexplicably on the city’s streets, highlighting just how difficult life can be. Michael Newey, chief executive of Broadland Housing, says it is difficult to change attitudes about homelessness but art has a key role in engaging people in different way. Universal credit was also mentioned as creating a difficult environment for people with Cllr Harris stating that even if people do get a flat, without support it can be incredibly difficult and very isolating. Family breakdown, overcrowding and financial problems are a big cause of homelessness for young people. Around 19 per cent of children say food is becoming an issue and while the number of people in work is rising, the number of people in work and in poverty is rising too, said Rob Lancaster, advice services manager from MAP. He spoke about helping people before they become long-term homelessness and how hope can disappear further down the line and addiction is then more likely to apply. 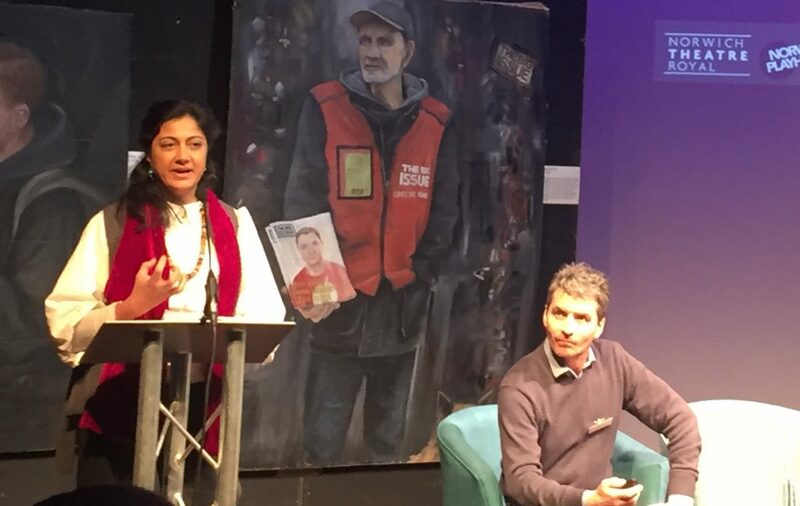 But many of the contributors talked about the positives of projects like Creative Matters to ensure a connection and understanding of the human beings behind the people who are homeless on the streets. Mr Crocker told the audience that there are divisions in society but that ‘creativity had the power to unite people’.